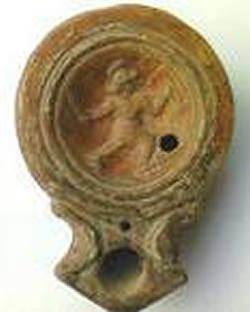 Sometimes the fakery of lamps is revealed by inaccuracies in the scenes depicted on them. Although the fakers may be masters at recreating the technical aspects, the depth of their knowledge of the classical world may not be always on the same level. The two examples of fake lamps discussed here reveal that the faker blindly copied scenes from real lamps without really having the foggiest idea of what he was copying and he completely misunderstood them. The fake lamp on the right is a copy of the real lamp on the left. 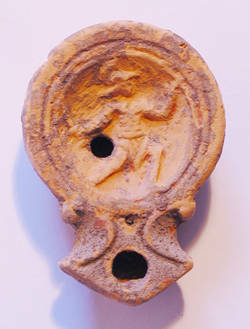 To the faker, the real lamp appears to show an animated gladiator in the act of fighting. Although the gladiator is obviously holding his sword in his right hand it was not so clear what he is doing with his left - so the faker filled in what he thought the gladiator should be doing with it. He has lowered the left arm a little and added the outline of a shield around the left hand, as if the figure is holding it. The faker completely missed the clues to what the gladiator is really doing with his left hand because although he may have had modern ideas of swashbuckling heroes, he was unfamiliar with the way that gladiators fought and the conventions used in portraying them in ancient art. For one thing, a gladiator is seldom portrayed holding his sword out to one side when actively engaged in fighting. The short sword carried by a murmillo (the type of gladiator intended here) was used mainly for thrusting (not slashing, like some later swords) and would be shown pointing forwards in front of him, towards his opponent. Gladiators were not suicidal; they kept their posture compact when fighting, to present a heavily defended target. For another thing, although it may look exciting to modern eyes accustomed to the antics of Zorro, gladiators were not shown fighting with their legs strangely akimbo, left leg bent acutely at the knee and right leg dragging behind. In fact, the gladiator is not fighting at all! He is in the act of surrendering. He holds his sword out to the side to show this to his opponent, and his legs are acutely angled because he is about to kneel. His shield is not shown because he has already lost or discarded it 1. So what is he doing with his left hand in the air? Hailing a cab to get him the heck out of there? Actually, he is making the conventional gesture of submission: raising the forefinger of the left hand 2. 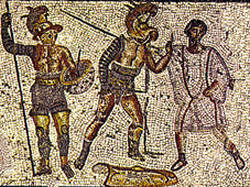 This same gesture is also shown by the central figure signalling his submission to the referee in the mosaic at right. At least the gladiator on the real lamp retains some dignity in defeat. The figure on the fake lamp incongruously holds a shield up in the air instead of raising his forefinger 3 but the faker has replaced his loincloth with what looks more like a bulbous nappy and the poor fellow may well be fleeing the arena overwhelmed by embarrassment. Copyright © 2007 Henty & Jackson. All rights reserved.